7-Zip 15.12 stable released version (2015-11-19) for Windows. Are you able to update "7za.dll" Inside "D-Fend Reloaded", to "7za.dll v15.12 (2015-11-19)" stable released version soon ? Until you include the "7za.dll v15.12 (2015-11-19)" stable released" update, ... did i use x64 or x86 "7za.dll" Inside your D-Fend Reloaded software ? yes, I can update the 7za.dll library with the next version of DFR. But at the moment I haven't got any plans for a new version of DFR. So updating 7za.dll could happen in the more distant future. You have not responded this question. Did for the moment, i can place manually myself, the "7za.dll v15.12" x86 or the x64 version inside your software? Or it need programmation from you, to be able to use this "7za.dll v.15.12". Also what will be needed "7za.dll x64 v15.12" or "7za.dll x86 v15.12"? DFR is a 32-bit program, so it needs the 32-bit version of the dll. Just been having an issue with DFR crashing on me when I try to run my games. And a google search reveals this issue has been raised before.. namely the MIDI settings crashing everytime a .conf file is generated. I use CoolSoft VirtualMIDI but I have the same effect on a PC with BASSMIDI instead. I haven't sadly been able to try it on a PC with no additional 3rd party MIDI software (yet). At the time, Alexander seemed to believe it was due to the default template having no disks/volume records defined in it (indeed, he lists it as fixed in the release notes for 1.3.0) but I can assure you the default template disks are there and defined. In fact, they are not altered from the out of box settings. Luckily, using CoolSoft as my default MIDI device in Windows, then simply using 'intelligent/win32' allows me to use my MIDI software just fine. Is there any additional bug info or reports I could give you to aid you in fixing this issue, Alexander? Not that it's important in my specific case but i thought I might be able to aid reproduction of the bug. Here you can enter any custom MIDI configuration (refer to the DOSBox manual for the syntax). These lines are passed to DOSBox without any further processing by DFR. So I guess this can be fixed by either making dfr understand both presentations of paths, choosing not to rename the path in "other emulators" or changing the paths in game profiles as well. I suppose the easiest fix would be to remove the forced word wrap. I've tried to reproduce the problem but if I follow your steps the path name does not get shortened on my system. The path name of the custom emulator just stays (as expected) in long format. 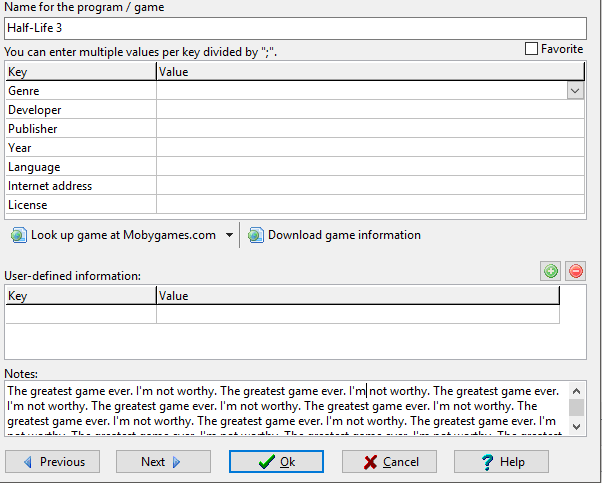 The automatic word wrap in the notes fields are intended. So the user does not need to wrap texts in longer paragraphs or to scroll while reading. If you resize the main window or the notes section inside the main window the word wraps in your example strings will disappear. Also the tree in the profile editor window can be resized to make the right section larger and therefore to allow longer lines. For the 1st one: interesting, it does that to me constantly. Any idea what my conflicting setting could possibly be? Looks like the run time library edit boxes are adding line wraps when wraping a long line into multiple lines. When storing the text back I cannot distinguish between the original and the added line wraps. Are you planning to support Dosbox-X anytime soon? I didn't know DOSBox-X yet. If it's using the same configuration file format as DOSBox, you can just add a DOSBox-X installation as an extra DOSBox installation for being used in DFR via the setup dialog. If it's working in a completely different way, you can still use it by adding it as a custom emulator in the setup dialog. At the moment I'm not planning to add any specific DOSBox-X support to DFR. Lately I have been playing around with DFR vs the front end I normally use. Something curious I have noticed. I installed MUNT & tried to use it with several games that do support MT-32. They sounded aweful. I tried it in DFR & the sound was as it should be - sounded great. I then took all the lines under [midi] in the DFR game profile & copied them to [midi] in the profile the other front end used. I then bypassed the front end by creating a dosbox shortcut directly to the profile. It still sounded like crap. What is DFR doing that is so much better than the other front end with regards to MT-32? DFR is not doing anything special. All communication with DOSBox is done via the conf file. So identical conf files should lead to identical results. Maybe not only the settings in the [midi] section have influence on the sound quality in the game you are using. The available CPU cycles for example may also have an impact on the sound quality. With my installation of Windows I have moved my user profile (and user directories) to my D: drive instead of the C: drive which is where Windows is installed. I have been trying to get DFR to setup and use its data directories under D:\Users\<username>\D-Fend Reloaded but am not managing to get it to cooperate. When the program is installed, it by default creates its user directory structure under C:\Users\<username>\D-Fend Reloaded. I then go into the program options and change the directories to point to the D: drive instead of the C: drive. If I then quit the program, delete the DFR folders on the C: drive and then restart DFR, it prompts with the first-use dialog box and, after I select OK to continue, it simply recreates all of the data directories again on the C: drive. How can I get DFR to use the D: drive for all data instead of C: ? BTW - this is installed in operational (non-portable) mode. Changing the base folder for relative path names does not change the location of the configuration folder. It only means relative path names like ".\VirtualHD\SomeGame" in the profile editor are interpreted as relative to some other base folder. If you want to use some other directory than "%UserProfile%\D-Fend Reloaded" as data folder for DFR, you have to install DFR in program folder mode or in portable mode. The easiest way to get DFR to some other folder or drive is using the "Transfer programs..." function from the Extras menu. This function is intended to transfer games from one installation (for example the default user directory using installation) to another one (for example a portable installation on an USB stick). By checking the "Create portable D-Fend Reloaded installation in destination folder" you can also copy the program files (by keeping all user settings but setting up the destination installation to be a portable installation). So start your old default installation (using the data on drive C:), select the "Transfer programs..." function and create a complete copy of DFR and all games on drive D:. When starting the new DFR installation on D: it will just use the data on D: and you can remove the old installation and the "%UserProfile%\D-Fend Reloaded" folder. Alexander wrote: Changing the base folder for relative path names does not change the location of the configuration folder. It only means relative path names like ".\VirtualHD\SomeGame" in the profile editor are interpreted as relative to some other base folder. If you want to use some other directory than "%UserProfile%\D-Fend Reloaded" as data folder for DFR, you have to install DFR in program folder mode or in portable mode. The easiest way to get DFR to some other folder or drive is using the "Transfer programs..." function from the Extras menu. This function is intended to transfer games from one installation (for example the default user directory using installation) to another one (for example a portable installation on an USB stick). By checking the "Create portable D-Fend Reloaded installation in destination folder" you can also copy the program files (by keeping all user settings but setting up the destination installation to be a portable installation). So start your old default installation (using the data on drive C:), select the "Transfer programs..." function and create a complete copy of DFR and all games on drive D:. When starting the new DFR installation on D: it will just use the data on D: and you can remove the old installation and the "%UserProfile%\D-Fend Reloaded" folder. Thanks Alexander. Am I correct that reinstalling in portable mode would be the same as installing using the defaults and then following your "Transfer programs..." instructions above? I have uninstalled DFR and so want to know if simply reinstalling in portable mode would achieve the same thing as you are suggesting. Are there any downsides, limitations or other issues associated with running games from a portable mode install? Yes, reinstalling in portable mode would do the same. Does anyone know of any working repositories for dfr? All the ones that used to work (That I could find) are dead and it's easier for my old eyes to use a repository than the manual way. How use dosbox-x with dfend reloaded? If I copy dosbox-x.com in dosbox directory, defend doesn't load dosbox-x.exe. If I rename dosbox-x.exe in dosbox.exe, dfend said an error.